The Star TSP1000 is a direct thermal printer for receipts and tickets in kitchens and storage facilities with high print turnover. Its integrated compartment for up to 30 tickets, its large paper roll capacity up to 180 mm, as well as its simple paper re-loading make this device the right choice in many professional settings. The printer can handle a wide spectrum of material with a weight up to 150 g/m2, from simple receipt paper and daily lottery tickets to high-end tickets and entry cards to events. For more flexibility, it can accommodate paper widths from 42 to 82.5 mm, plus it has an adjustable end-of-paper-roll sensor. With up to 180 mm per second, receipts and tickets are created at 8 dots/mm 203 dpi resolution, with an optional two-colour print. For neat and easy separation, rely on the integrated auto cutter. 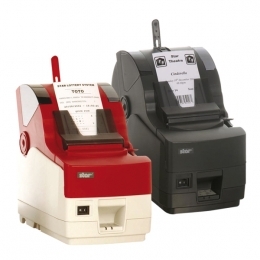 The direct thermal printer comes in three attractive colours cherry red, black and white. Choose models with serial, parallel or USB interfaces, or the model without interfaces, for the subsequent installation of an Ethernet interface.